As a floral designer, you can usually find me working behind the scenes of styled shoots and real-life weddings. My husband Josh and I recently renewed our wedding vows after six years of marriage, and this was the first time since our wedding that I had stepped out creatively to plan an event from start to finish! Our family recently settled near Kamloops and our move from Calgary to British Columbia was a leap of faith and commitment to our marriage and family. Between raising two young boys, growing a business, and a career that takes Josh all over the world, we didn't see much of each other until after our move. Settling into our new home together, felt like falling in love all over again, and the timing was perfect to renew our vows and our commitment to each other. One of the first things you see when you arrive in Kamloops is Monte Creek Ranch Winery. It's mission style architecture is a breathtaking beacon in the rugged landscape. As we drove into Kamloops for the first time, I felt it would be a special place for us, and when I approached them about hosting our vow renewal, they welcomed us with open arms, and a bottle of wine! Josh and I really wanted this day to be an expression of our relationship, our beautiful adventure together! Working in the wedding industry has allowed me to connect with incredibly talented vendors, and it was amazing to work with them so closely on something so personal. We choose White Olive Photography to capture our special day because Melissa has such an incredible way of capturing the joy and all the belly laughs! Cande Bridal Boutique provided a gorgeous gown, and Styled by MUAH made me feel absolutely beautiful in front of the camera. Josh wore his favorite Rogue Territory attire, his Red Wing Boots. After all, I had put him to work, hanging the macrame hammock and pitching our canvas bell tent! I created the florals of my dreams and styled the tent to create the perfect backdrop for exchanging our vows and enjoying the view. To Have and To Hold Design created stunning vow books, to hold the original vows we wrote and exchanged six years prior. It was so incredible to exchange the words we'd written so many years ago and I couldn't help but smile about all that we had been through together and how those commitments had led us to this very moment. 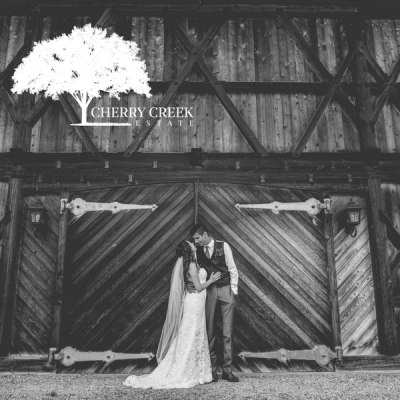 After we exchanged rings, we enjoyed some of Monte Creek's award-winning wine and charcuterie at our sweetheart table. My vision for the table was to recreate the picnics we used to share when we were dating. Josh and I would grab a bottle of wine and charcuterie and set up wherever the sun was shining. The table was inspired by the landscape and winery, natural and rustic with an element of romance and elegance. Josh has a total sweet tooth, so there had to be cake! Cocoa Dot cakes created the most stunning mustard colored cake for two! It was almost too exquisite to eat, but we savored every bite! After a celebratory toast, we headed into the winery and had some fun, running through the vineyard and holding hands. Melissa played our favorite songs that we listened to when we were dating, and we danced to Band of Horses as the sun began to set. It was the perfect ending to a beautiful day and renewing our vows was one of the most epic and romantic moments of my life, a memory we will cherish together in all the years to come.